If you’ve ever watched the “Big Bang Theory”, you know that one of the running jokes is Leonard’s lactose intolerance, and how awful that is, not only for him, but for all those around him. I too, know the agony of praying that no one else could smell what just happened, or the terrible realization that I just ate dairy products without the benefit of Lactaid®. While it is funny when it happens to someone else, no one in my family found it very humorous, at least while it was occurring. Like Leonard, jokes have been made about how such an odor could occur from someone who is still alive and well. Before I digress completely into bathroom humor, let me get to my point, to share a wonderful solution I have found. Yes, I am promoting a product, but I am getting nothing from them, and they don’t know I am alive, let alone singing their praises. 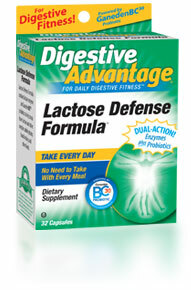 It is Lactose Defense Formula by Ganeden. Believe it or not, you take it once a day, and it works all day. Last night I had pizza, and I have stopped drinking lactose free milk. Talk about walking on the wild side! In any case, it worked for that, and does the trick, day in and out. I felt compelled to share, because I believe milk is good for most people, and I hear about people avoiding it from L.I. all the time. You don’t need to avoid it, and you don’t have to carry Lactaid ® all the time.